777 Binary are no longer trading. For a list of alternative brokers, and full comparison reviews, visit our brokers page. 777 Binary has positioned itself as the destination of choice among serious traders by offering the largest selection of binary options types as well as a variety of exciting ways to trade them – all on a platform that is visually stunning, remarkably intuitive, and incredibly fast. Traders can earn up to 97% profit per trade (as high as 550% for One Touch trades) and select markets are available for Weekend Trading as well. The high payouts, breadth of tradable assets, variety of binary option types makes 777 Binary the non-stop trading destination for traders seeking a professional and potentially lucrative way to trade any time, day or night. 777 Binary has some of the most attractive bonuses in the industry including a 100% Welcome Bonus which doubles a trader’s account balance, providing them with the leverage to trade confidently. They also have a lucrative Refer-a-Friend program available to 777 Binary traders who open an active account and refer their contacts to do the same. Opening a 777 Binary account takes minutes and can be done from the website’s homepage. The minimum amount to fund an account is 200 USD or 200 EUR and there is no registration fee. There are a number of methods for funding and withdrawing from an account including all major credit cards, debit cards (deposit only), wire transfer, and CashU. a) Currencies: Popular currencies like GBP/USD, EUR/GBP, EUR/USD as well as niche currency options like AUD/USD, USD/BRL to name but a few currency pairings. b) Commodities: Gold, Silver, Platinum, Coffee, Sugar, Oil. c) Stocks: An impressive list of international stocks including Microsoft, Nike, Apple, Citigroup, BP, Gazprom, Coca Cola, Toshiba are just the tip of the iceberg. d) Indices: Household names like DOW, S&P 500, NASDAQ, FTSE 100, NIKKEI 225 as well as SSE 180, Bombay SE, EGX 30, and CAC are just a few among an impressive listing of indices. A complete list of the more than 200 tradable assets with detailed descriptions is available on the 777 Binary website under the Assets Index header tab. 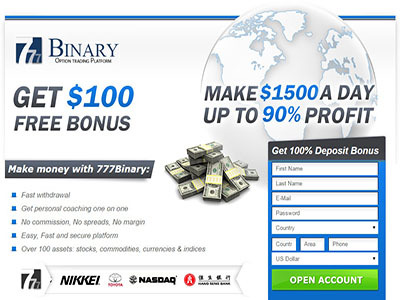 777 Binary offers a choice of 5 unique binary option types to meet the needs of all binary options brokers: Call/Put, Options Builder, One Touch, 60 Seconds, and Open Platform. The company also features a regularly updated list of Hot Assets. Call/Put – Click “Call” if you think the asset price will rise above the current rate at the expiry, or select Put if you think the price will fall below the current rate at the expiry. Option Builder – Select an asset, set the expiry time, and select the Profit/Risk percentage which ranges from 70%/10% In the Money or Out of the Money to 10%/80%. Lastly, select Call or Put. One Touch – This option type has a preset expiry and a fixed price target above and below the current value. Traders choose either “Call” or “Put” based on their belief that the price will rise or fall and are “in-the-money” if the price hits the correct target at any time before expiry. One Touch options have extraordinarily high payouts of up to 550%. The 60 Seconds Option is the trade of choice for those looking for an exhilarating, fast-paced form of binary option trade in which the expiry time for an asset is one minute. Savvy traders use the 60 Seconds Option on currencies, commodities, and indices to great reward by making a series of quick, successive trades on an asset that is clearly trending in a certain direction. The Open Platform provides a way to maximize earnings by making mid-trade adjustments on individual positions. An investor can “Double Up” the value of a position’s initial investment before the expiry. This tool is executed to great effect when a trade appears to be in-the-money as the expiry approaches. Traders can “Rollover” or delay the expiry time of an option up to 10 minutes before it initially expires by increasing the position by 30%. When a position is trending in the desired direction but needs more time to overtake the initial value, the Rollover can be the difference between losing and winning a trade. The Open Platform also displays detailed analytics to track an asset’s trading history and lets investors follow their traded positions directly on the graphic. Customer service is available via 24/7 live chat, phone and email. 777 Binary provides excellent aid and assistance from a professional and multilingual customer support team. 777 Binary is the destination for traders looking for an exciting and intuitive way to trade binary options around the clock. Few brokers offer such a broad spectrum of assets to choose from or so many interesting ways to trade, and no other broker combines their selection of asset and option types with 97% payouts.